We operate our own centralized dermatopathology laboratory, providing accurate and timely biopsy results for our patients. Under the leadership of Michael Morgan, MD, our team of dermatopathologists, histology technicians and laboratory administrative staff works alongside our dermatologists to meet and exceed the standards of care. 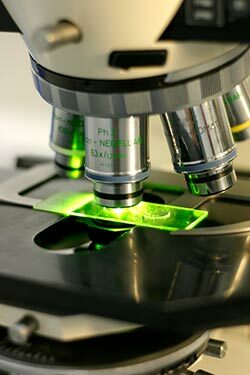 We adhere to specific quality assurance procedures, working through a detailed documentation of the patient’s history and clinical impression, gross examination of the biopsied lesion, tissue processing and complex tissue staining methods to prepare quality tissue slides for microscopic analysis. Our lab is accredited by CAP, the College of American Pathologists, acknowledging the best use of policies and procedures.